I keep this page as updated as possible. However, you can always contact us for current information/availability. 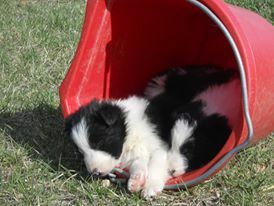 Each of our Border Collie puppies go to their new homes with full registration, up to date on all shots and deworming, fully socialized, a written health guarantee, and a puppy information packet. 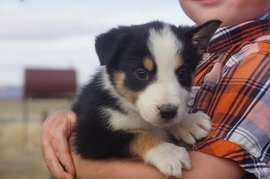 We also send a Mill Iron S hat home with each puppy AND a $50.00 off coupon for your first Stock Dog clinic here at our ranch! All of our puppies are raised around and well socialized with other dogs, small children and a large variety of animals, sights, sounds and smells! 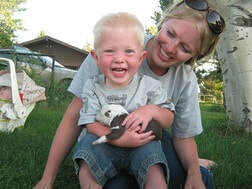 We are also happy to micro-chip your puppy prior to it leaving for its new home for a small additional charge. We do accept $200.00 Deposits to secure your puppy/pick order. Deposit will hold your puppy/pick order. Our puppies are picked out in order of deposits. Deposits are considered non-refundable, but may be moved to other litters. We would be happy to talk with you about what you are looking for in a Border Collie, and help you pick the perfect litter and puppy for you and your needs! We do occasionally have OLDER PUPPIES available. DON'T FORGET TO ACTIVATE THE MICRO-CHIP WITH YOUR CONTACT INFORMATION! If it is easier for you, we can micro-chip your puppy AND activate the micro-chip with your contact information before the puppy leaves for their new home. It is just $45.00 for us to do it all for you! Puppies are expected to be picked up for their new homes and paid for at 8 weeks of age unless prior arrangements have been made. We reserve the right to refuse sale of any of our dogs/puppies to anyone at anytime regardless of deposit status, if we feel it is in the best interest of the dog or puppy. We accept Paypal, credit cards, personal check, cashiers check & money orders. Major Credit cards are accepted through Paypal or via Square. Personal checks must have time to clear before a puppy leaves here. You can also put down a deposit with your Debit/Credit Card using SQUARE. To do so, I will simply email you an invoice to pay online. SQUARE payments will have 2.75% added to the total ($205.50). Let me know if you would like an invoice emailed to you! VENMO PAYMENTS DO NOT HAVE ANY ADDITIONAL FEES. and knowledgeable! NuVet is not available in stores. NuVet is produced in an FDA Pharmaceutical approved building. Produced to the HIGHEST standards! MADE IN THE USA! There are a lot of good dog foods out there. While we don't advocate for any particular dog food ( although we do LOVE what we feed), we HIGHLY recommend doing your homework on dog food! Get recommendations, read labels, talk to your veterinarian! More expensive does not always mean higher quality! Grain- Free and Boutique style pet foods are not always best! ​ NuVet as a supplement is an EXCELLENT source of additional nutrients and vitamins for a growing puppy. Do not be afraid to supplement! Check back soon! We update our puppy pictures each week, so you can watch your puppy grow!